The other day I had a random craving for Paella. It's not exactly something you can order as a takeout and since there are no decent spanish restaurants near where I live, I decided to jump in and make it at home myself. I was a bit wary at first, but once I had picked up the required groceries and started the prep, I started to get into it! 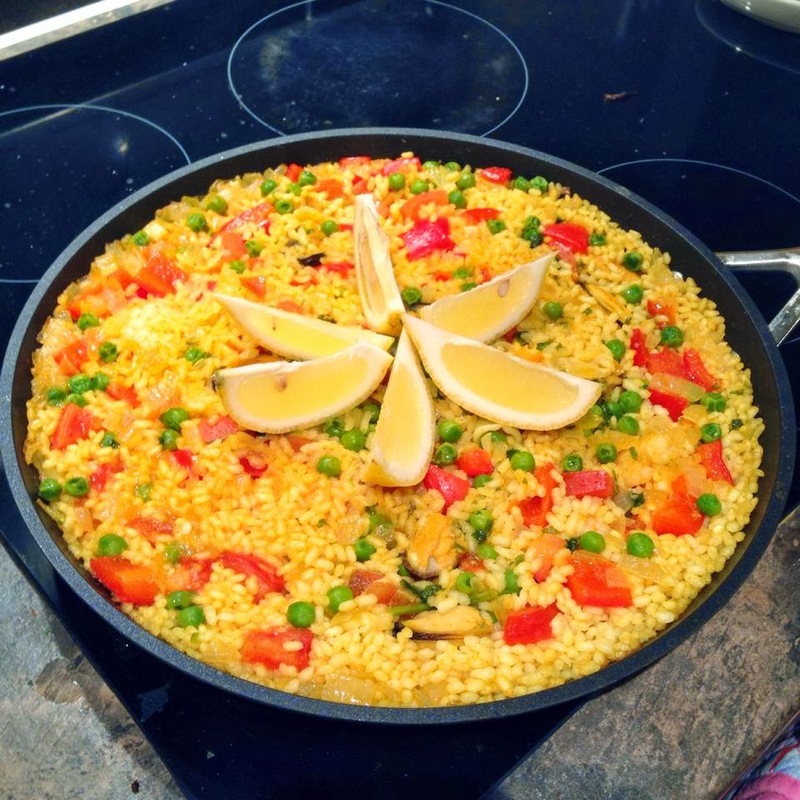 Paella is one of the world's most recognisable dishes, and yet its one of the simplest to make! I researched quite a few recipes online and then took bits and pieces from each to make mine. I didn't really measure while I was cooking because I find that gets in the way for me, but I'll try and approximate what I used. Ideally you will need a large shallow pan to get the desired effect but you could make this in a regular pan too. Heat up the olive oil and add the chopped onions, red pepper, and crushed garlic. Pan fry for 5 mins on medium heat. Then add the seafood, frozen peas, and enough of the stock to cover everything. Let the stock heat up and then add the rice. Add the salt, red chilli powder and mustard powder and stir gently. Real paella uses saffron for the distinct yellow colouring, but mustard powder gives the same effect. Let it cook on low heat and keep adding stock as it evaporates. I placed some aluminum foil on top of the pan to speed up the cooking process, otherwise the rice can take a while to cook. Add the rest of the stock and turn the heat down. When its cooked add the chopped parsley and lemon slices for garnish, and you're done!